Until quite recently, mountain architecture and its interiors have followed time and climate tested designs—homes like cabins, lodges and chalets. These robust designs withstand the heavy loads of winter snow and their thick walls and big stone fireplaces fight back the winter chill. 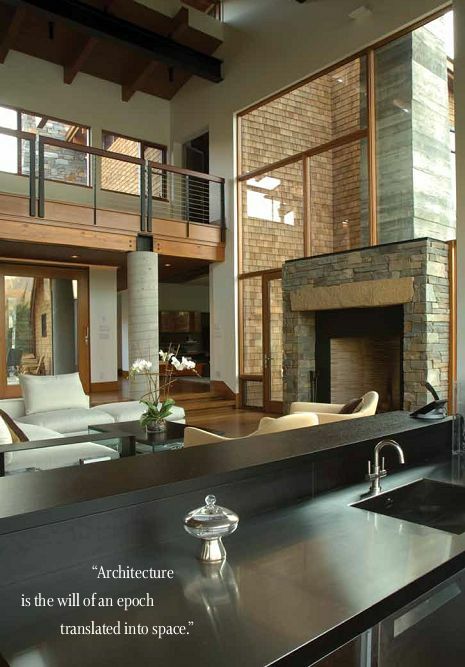 Local craftsmen constructed these rugged and rustic homes using local materials and knowledge. Vernacular in approach, these mountain homes not only relied upon traditional designs, they were also constructed from nearby available materials like logs, timbers and stone. Interiors followed suit with warm woolen plaids, nature’s hides and fur, and pine and timber furniture. Traditional mountain design is immersed in tradition, practicality, and comfort, and largely escaped from the shifts in style found in urban areas. Going to the cabin carried a meaning of escaping to a natural and genuine surrounding that offers a chance to realign with an earlier and simpler time and way of life. In contrast, the origins of modernism were abrupt and intellectual. “Architecture is the will of an epoch translated into space,” declared trailblazing master of modern architecture, Ludwig Mies van der Rohe, who is referenced as a founder of modernism along with Walter Gropius and Le Corbusier. At the beginning of the 20 th century, industrial advances brought standardization and prefabrication along with glass, steel, and concrete as building materials. Intellectually, following the First World War, thinkers were seeking to free themselves from the past. In architecture, the goal became function, as hones expression of structure and materials, and a rational, unsentimental approach to design. The pioneers of modernism adopted a fitness of purpose expressed in a desire to simplify and eliminate the superfluous. “Less is more,” repeated Mies van der Rohe. Ornamentation and historic allusions, things that drove designs in the past, became superfluous. The modernists that came to California, as exemplified by Richard Neutra and to a lesser extent Rudolph Schindler, pursued residential architecture that extended to connect and transition to the physical site. This means creating interior open spaces that looked out a window that comprised most of the wall to the views and landscaping, creating transparency from inside out in ingenious ways, and designing terraces and patios as outdoor room extensions to the interior space. The interior furnishings, too, were rethought. They became simpler, made from new materials like steel and plastics, manufactured, easier to clean, and often less expensive. Interest in modernism never disappeared, but certainly dissipated until a revival brought mid-century modernism again to the forefront. Concurrent with the resurgence of modernism, architects, builders, and their clients were looking at a new fitness of purpose—sustainability and green building. Reducing the environmental footprint of the structure means reconsidering the design for a number of factors like solar orientation, energy and water efficiency, material selection, and performance. The third element of this alchemy is the shift in demographics. A large number of people are opting for a healthy, active, outdoor lifestyle in the mountain communities of the west. For them a vacation isn’t enough; they want to live in the areas they love either full or part-time. This combination in various forms has birthed Mountain Modern design. Now, mountain meets modern. It is an exciting time for new homes created by using the modern materials of concrete, glass and steel juxtaposed with traditional mountain timber and stone. The design draws the occupants’ eyes to the outdoors where windows frame the mountain setting, and doors open to outdoor living spaces. Homes blend into the contours of the landscape with clean simple lines that parallel the new modern aesthetic. 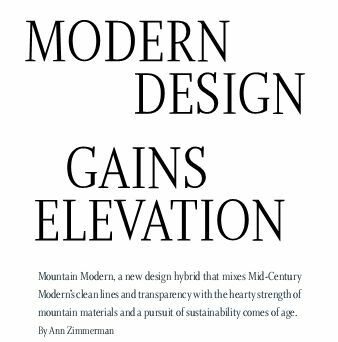 Mountain Modern design is dynamic and evolving, and it’s about mixing and combining elements with fresh ideas. It is fresh, new, and daring, filled with individual innovations and creativity from talented architects, bold builders, and undaunted designers.